56 Agatha Christie OTR Old Time Radio Show Episodes-Audio Book MP3 CD-30 hours! 102 OLD TIME RADIO CHRISTMAS SHOWS SELECTED FROM YOUR FAVORITE OTR PROGRAMS! 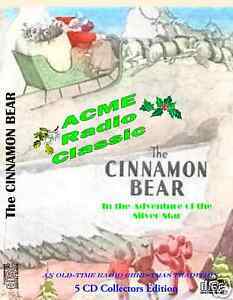 Details about The Cinnamon Bear! - New 5 Disc CD from ACME-Radio! Super fast shipping. Excellent seller. Thank you! Thanks for being a great seller! Well packaged! Thank you! Beautiful item! I love it, and can't wait to listen at Christmas. It will be a great family activity!